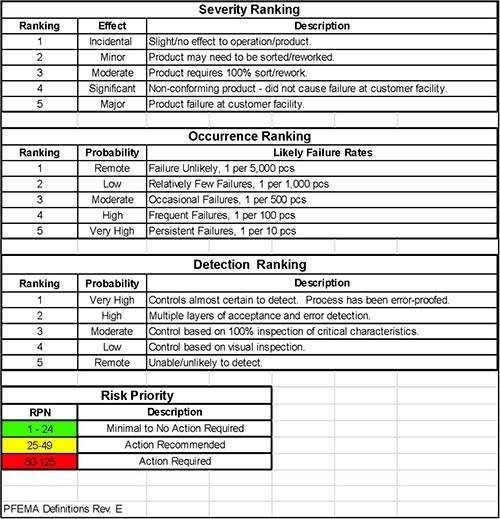 The February 2017 Modern Machine Shop article, “Managing Risk”, detailed how Protomatic developed a PFEMA system to identify more than 300 potential failure modes and procedures to mitigate those risks. The article has created a flood of requests for more information. We are providing the following to give more information to customers concerned with extracting the best quality from their suppliers. PFEMA stands for Process Failure Mode and Effect Analysis. It is a document that states all the possible ways a process or product can demonstrate a manufacturing or product weakness, and provides a solution to prevent the potential problem. The document is comprised of two major sections called Risk and Mitigation. The “Risk” section is a list of all the possible problems that could occur when producing a product. An example of a risk: customer order was not entered. The error is simply that the customer’s order was not received or processed. The “Mitigation” section of the document provides the solution. It spells out the method to minimize the known risk. An example of the mitigation to prevent “customer order was not entered” could be: Order Entry Procedure #PRC-03-01, Employee Order Entry Training TRN-089; customer was sent an acknowledgement and confirmed the receipt. Additionally, the Risk and Mitigation sections are scored based on severity, occurrence, and detection. The scores are multiplied and an overall risk called the “Risk Priority Number” (RPN) is assigned. A high number means more risk; therefore, a better mitigation needs to be in place to minimize the failure mode exposure. There are two basic types of PFEMAs in the industry. The difference between them relates to interpretation of the “P” in PFEMA. The use of “Potential” typically refers to a product, and the use of “Process” relates to a manufacturing method or service. CNC shops would typically use the Process FEMA. Many companies making a process-based PFEMA will create a generic document. This generic document will cover all the risks and mitigations for all the processes that a company is responsible for in the manufacturing of a product. Some customers do not like the generic PFEMA, so a part-specific PFEMA may be requested. This will be a subset of the generic PFEMA and will be a more controlled change record since it is a document tied to the control plan and validation process. At Protomatic we do both, but favor the generic because it is always up to date. A higher number for severity means there is more of an impact on the product performance if the potential failure mode goes wrong. A higher number for occurrence means that the situation typically occurs more often. For example, if 1 of 100 pieces has a paint flaw, it would have a higher occurrence number than if only 1 per million has a paint flaw. The detection number is related to the accuracy of the measurement technique. Visual or subjective methods may have a higher detection number, versus a CMM measurement. This creates a maximum score of 10x10x10=1000. Each potential failure mode is scored, and depending on value, a mitigation action is determined. This 10-point system is the most common system for the transportation industry. For medical applications, Protomatic uses a system with 5-point scoring, creating a maximum of 125. The severity ranking, occurrence ranking, and detection ranking are based on our business, which involves low-volume batch sizes. Although we produce batch sizes from 1- 150,000 pieces per year, our average batch size is relatively low. Keep in mind, sometimes the RPN system is defined by the industry served and should be consulted prior to implementation. The first step in getting started is to Identify your risks. Ask “what are the potential failure modes”? Repeat for each department. It is that easy. Score and then provide the mitigation, the solution. The biggest reason for the interest is that the new ISO-9001:2015 standard will require a PFEMA, historically only present in ISO-13485 and AS9100 standards. Therefore, the timeliness of the “Managing Risk” article created many requests for a complete copy of Protomatic’s PFEMA. Our position is not to give a copy. First, the Risk is a list of all the ways in our manufacturing process that an order can be improperly processed. This is unique to Protomatic and may not apply to others. Second, the Mitigation can be misused or interpreted incorrectly because another firm does not have access to the solution(s) that are unique to Protomatic. If you have further questions, please call Doug Wetzel at 734-426-3655 or email doug@protomatic.com. About the author: Doug Wetzel is Vice President and General Manager of Protomatic. Protomatic is a CNC precision machining shop specializing in prototype and short-run production components for the medical, aerospace and other technical industries. Because of the critical nature of the parts they design and manufacture, the emphasis is always on Life-Saving Precision. If you have questions our dedicated sales team will be happy to assist you. © 2019 Protomatic All Rights Reserved.